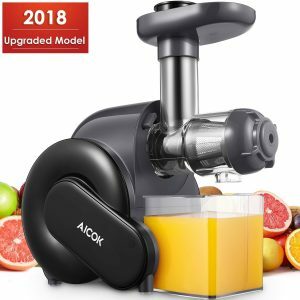 Aicok Slow Masticating Juicer is a cold press multi-purpose juice extractor with a unique wheel shape design and an efficient and powerful yet quiet 150W motor (120V-60Hz) with a low rpm that operates at less than 60 decibels of noise level, which is equal to normal chat. There will be as little oxidation and foam as possible and most of the healthy nutrients, enzymes, minerals, and vitamins will be kept in your juice jug or cup. 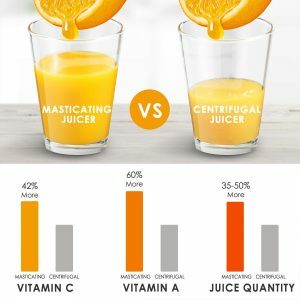 You can expect up to 40% more vitamins and minerals extracted in up to 30% more juice than regular centrifugal juicers (higher juice yield). It weighs 10.5 pounds and is compact with the measurements of 13.8 x 10.9 x 9.9 inches and will take up very little space. It is a small juicer but capable of juicing as well as any other large juicer. The foam will be filtered through the built-in filter baffle. You can extract the juice of different ingredients like leafy greens and fibrous fruits and veggies, including wheatgrass, celery, oranges, apples, and ginger. Please note that you can reset the juicing with a single touch release. It comes with a larger juice jug and a brush for easy cleaning and you can put the detachable parts straight into the dishwasher. Aicok Juicer has the reverse function to prevent clogging. It is FDA and UL certified for security and anything that comes in touch with the ingredients is BPA- free. As a masticating juicer, it keeps more of the healthy enzymes, vitamins, minerals phytonutrients with the slow grinding or stone-milling. The high RPMs of centrifugal juicers can destroy the enzymes and nutrients. With fewer cell walls destroyed and if stored in the fridge properly- covered with a lid, you can keep it for up to 24 hours. There will be more air trapped in centrifugal juicers and this causes faster oxidization that is not really good for you. It runs much quieter than the very loud centrifugal juicers (12,000rpm speeds), at less than 60 decibels of noise level due to the low 80 rpm speed. You shall have no problems juicing the leafy greens like spinach and kale or wheat grass. But please don’t put anything hard, frozen fruits, ice or big seeds into the feeder tube. In case the juicer is clogged, you need to turn it off and press the Reverse button to unblock. As a safety precaution, you shouldn’t run it for more than ten minutes at a time and pause for at least ten minutes if you did so. In the box, you’ll find the Aicok Masticating Juicer, a pulp jug, a juicer jug, a cleaning brush, a user manual and a recipe book. You’ll get pure and smooth juice without any flesh or pulp that is also very dry with all the juice taken out of the fruits and veggies. This way it will also turn out quite economical for you. It is easy to put together with the instructions with photos and you can start using it straight away. There are three prongs on the cord that is 45 inches long. It is offered with a solid three years of warranty by the manufacturer along with a tech and customer support for 24 hours a day.